Susana Monteverde is the owner of SuMo Art, specializing in art education. Susana seeks to build rich connections between people and contemporary artworks. She is also the President of the Friends of Women’s Studies at the University of Houston. She is married to William Grimsinger and has one daughter, Isabel. My last undergraduate semester, I decided to take a class with Sue Mayer, who taught Museum Education. When I told her that I was from Theater, she said, “I love Theater people! Come!” Her class was called Methods of Art Presentation. A boring title but it was an unusual course geared towards future art teachers, taught in what is now the Blanton Museum at UT. All education students had take a public speaking class and Sue thought it was ridiculous to have teachers, and art teachers in particular, taking just a standard public speaking class. Why not teach them about art presentation in an art museum? When I took that class, my world opened up. It was brilliant, like Technicolor! And I did it well! So in graduate school I studied Art Education with a specialization in museums. As I finished, my husband William was coming out of law school. We knew we wanted to stay in Texas because William had passed the Bar here, but where did we want to go that would offer both of us opportunities? We decided that Houston was that place because he had done a clerkship here and the museum scene in town is amazing. I started out as a freelance art educator, working with arts organizations and on projects all over the city. I worked for the Houston Center for Photography, writing curriculum and teaching a program called Girls Own Stories for 3rd and 4th grade girls in under-served communities. We would do autobiographical portraiture with them and it was so much fun! I was able to use not only my art education training but my theater training too. I also worked at the Contemporary Art Museum at the inception of their Frequently Asked Questions program. Contemporary art can be very challenging at times, not least when the Museum presented Andres Serrano and his best known piece, Piss Christ, which had a crucifix submerged in a beaker of urine. The photograph is so beautiful, the color and the atmosphere it creates is gorgeous, but it was obviously very upsetting to a lot of people. The Museum was very concerned about protests, so they created a Frequently Asked Questions team. Instead of having docents giving tours, they would have the FAQ team placed around the gallery ready to discuss the artwork with anyone who had questions. And it worked! In fact, it worked so well there was no controversy and they decided to keep the Frequently Asked Questions team on hand for subsequent exhibitions. I then worked at the Museum of Fine Arts Houston as the liaison officer between the museum and Talento Bilingüe de Houston. It was an experiment, set up to build stronger ties between the museum and the East End. This arts center is located in an industrial area that was not really intended for people to live in – full of warehouses, train tracks, derelict buildings, etc – a tough neighborhood where children were growing up in a very precarious environment. My job was to set up an after-school art program and a summer camp – very challenging but very rewarding. I have done a lot of pilot projects, that is my strength; I much prefer initiating rather than maintaining programs. So another pilot project I helped develop was the seed for what would eventually become the Young Artist Apprenticeship at the University of Houston’s Blaffer Museum. It involved bringing high school students into the university to make art on a daily basis so that they would have a relationship with the university and with an artist mentor, culminating in their own exhibition. 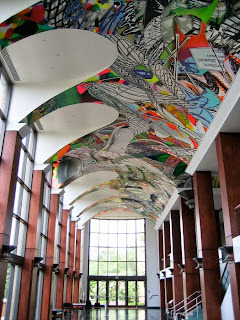 Because of my work at Blaffer, I was invited to be part of a team which painted a huge mural for Frank Stella in the Opera Hall at the Moores School of Music. We worked on it for about nine months and I learned an awful lot from many outstanding artists. I left the mural project to become the Director of Education at Blaffer and was there for four and a half years working under a really amazing director, Don Bacigalupi. We had a great working chemistry, and his populist philosophy fit right in with mine. Our staff was very tight knit and we did some very challenging artwork. We worked hard, but we played hard too. I loved it at Blaffer but just as the leadership changed, I gave birth to Isabel. I had never really thought about what I would do as a parent. I just assumed I would be a working mom, but something happened when I had Isabel. When I went back to work, it was hard for me to hand my baby over to someone else, but what scared me more was that while I was at work, I found that I wasn't thinking about my baby at all. It was terrifying. William is a tax lawyer, and around that time, his salary had increased so suddenly that I had the option to stay at home. It wasn't anything we had discussed and William was rather shocked. It felt rather regressive. I am a feminist and I understand all the politics, the power and independence that comes with earning your own money, and yet, here I was, putting myself and my child in the hands of my husband. That took a lot of trust. It was hard for William too, suddenly having the responsibility for us all on his back. In retrospect, though I wouldn’t advise young women not to make a similar choice, but I would advise them to have those discussions beforehand! I have continued to consult since then, but very informally and by word of mouth. Recently I formalized my business, which is called SuMo Art. As I’ve freelanced this past decade, what I've realized is that I love, and I am good at, is teaching people about contemporary art. I also enjoy connecting people both to art and to one another. It feels like I’m connecting people to what makes them human, to that part of themselves that is creative, thoughtful, introspective, aware. Last month I launched a trial program, Art Explorations, which is a seminar consisting of five visits to different galleries, museums, artists’ studios and the like. After every visit, those who wish to join me are invited to lunch and further conversation. We began the series at Moody Gallery, where Betty spent an hour regaling us with stories of starting an art gallery in the mid 70s when there were few women in the business. She showed us to the "secret" room (aka the kitchen) where she stages upcoming exhibitions and showed us brand new work, never seen before. The other major part of my life the last few years has been serving as President of the Friends of Women's Studies at the University of Houston, heading up a board of thirty amazing women, most of whom are breaking ground in their field, whether that is in energy, medicine, finance, philanthropy, academia etc. Friends is the community organization that helps raise funds for the Women's Gender and Sexuality Studies program to pay for scholarships and fellowships. We have dreams of expanding our two-year postdoctoral fellowship to include two or three post docs, thereby creating a community of scholars dedicated to studying women and gender issues. Friends also supports the Carey Shuart Women's Archive and Research Center at the university library which collects the papers and ephemera of notable women and women's groups in the Houston area. To date we have over 50 different collections which are available to the public to study and learn about the women who have shaped this amazing city of ours. Friends is very much a hub for women. Through our community programs, we connect the University to the community, facilitating direct contact between scholars and the women they study with information flowing in both directions. For example, our newly-named Barbara Karkabi Living Archives series invites panels of women for round-table discussions about any number of subject areas involving women, most recently, Women’s Activism, Then & Now. We also connect women to each other, most notably with our signature fundraising luncheon, Table Talk. Every year we invite fifty amazing women to host a conversation, each at a table of ten women. Maybe this would happen in every city, but every year we have a wealth of riches in possible conversationalists to choose from. We are now working towards our 2014 Table Talk and we know it will be incredible and that we are going to blow past our fundraising goal. I’m not an artist. My passion is in educating, in having that conversation which enthuses people and sets them grappling with art. As a result, I come to art education from an intellectual and educational approach rather than from a studio background. In fact, I was always very anxious about my art. I was one of those children who knew what I wanted my art to look like, but I just couldn’t get it to come out right so I would walk away. I enjoy helping other people get beyond that obstacle, to have a relationship with art whether they are makers or not. People can have a connection to art as viewers, as consumers, as “understanders”. That experience can be shut off for a lot of people because they think, “I’m not an artist. I’m not an art historian. I don’t know what I’m looking at. It has nothing to do with me so I’m walking away.” But what I love to do is to bring them back in. This presents me with two challenges, one which is posed by contemporary art itself, finding meaning and building interpretations of intriguing works of art which often times have not been studied or written about very much. The other challenge is facilitating a deep connection between the viewer and the work of art, engaging people in a dialogue, honoring the questions that arise when they are looking, and bringing to light the wealth of information embedded in the work of art. People are often amazed when I mention that works of art are as loaded with information as are books. We've been taught how to glean information from books, but we haven't been taught how to do that with art. So that’s what I am teaching. I help my students to be comfortable looking and asking questions. I want them to find answers, but more often than not, to find more questions without definitive answers. I want them to be comfortable with using their own formal and informal knowledge to create satisfying interpretations of artwork that otherwise they may just walk past and not give a second thought. Now that for me is exciting! My parents loved going to museums and they were friends with artists. Mexico took in a lot of ex-pats from the US during the McCarthy era and so I grew up around a lot of lovely left-wing people. Neither of my parents were artists but they spent time with this group of international people, artists and teachers, and that all had its effect on me. Also, my mother was an excellent teacher in her own right and I learned much of what I know about teaching from watching her at a young age. Houston is the kind of place that has porous boundaries which means very deep conversations about art are possible where in other cities it might not be the case. In Dallas or in New York, perhaps, it would be “If you need to ask, you don’t need to know”. I think there is much more of a divide. Something about Houston allows for real interaction. Maybe it is that there is less snobbery, maybe it is that if you have the enthusiasm or the idea, Houston says, “Go for it!” and it doesn’t matter where you come from or where you studied, or whose money is backing you. I’ve always found that very interesting. The other neat thing about coming to Houston is that it is so open-armed. You come here and people immediately welcome you into their circle and introduce you to their friends. The art community here is no different, it just welcomes you in. I am fortunate that William and Isabel are very supportive of me and they are not stingy with time or with encouragement, so that’s one thing I don’t have to battle. I do make sure I make time for myself in different ways. One is that I like to swim and do yoga and I walk the dogs. So I find bits of time, mostly in the morning. I know that if I don’t get it done in the morning, the rest of the day takes over. If I am not physically active – swimming or doing yoga – I am not a happy person. And a happy mom is a good mom! Also having a network of women friends is so important. I have been able to establish several networks of women friends in Houston. Isabel and I are part of a mother/daughter book club which is just incredible. I love it for the reading aspect and for teaching our girls the habit of reading and talking about books, and also because it teaches them how to engage intellectually with friends, something which I don’t think kids in this country see modeled very much. A lot of times, social interaction between adults is segregated from the kids. We find babysitters and go off to do social things with our adult friends, but it’s different with my friends who are not American. We have big family dinners with the kids around and they hear us talking politics, science, art or whatever it is. Oftentimes they join our conversations. With this book club, I not only love that I have a friendship with these mothers, but also that our daughters have solid connections with these women too. These are women that Isabel can access, that she can bounce ideas off and that, as she encounters challenges in her life, she can go to and share and get feedback from, knowing that they are women that I trust and that she can trust too. I think that is so important. I have also been part of another book club, with some of my closest friends, for 12 years or so. Until I joined this book club, I didn’t really read for pleasure. I read for school and for work, but never just for myself. It’s a really interesting group of women who all somehow or other find themselves outside of the mainstream. We are all pretty outspoken and we are all capable of fighting for our time and space to speak, and we are liberal of course. It is important for me to be in groups of people where I can express my social and political beliefs without having to censor them. Living in Texas, that is not always the easiest thing. You do encounter people who are way more conservative or way more religious than I am, so it’s nice to find that group of people where you can have an exchange of ideas and those ideas can be heard without it feeling divisive. In the pool. The day can be hell, but if I am in the water, I am just transported away. It’s surprising, but Houston has something like the third largest working artist community in the country. Houston has a vibrant community of working artists, museums, commercial and non-profit galleries and it is a treasure. It makes it possible for me to do what I do. Right now, it’s Pondicheri, owned and run by Anita Jaisinghani. She serves Indian food into which she integrates Gulf Coast ingredients. On her menu she might have crawfish curry or spiced okra during season. Her food is always so surprising. It’s just a revelation in your mouth. One of the things that I miss from living in Mexico City is that there is not a walking culture in Houston. I love the connection you have with a neighborhood and a community when you are on foot. Zipping past everything in your car, unless you have a destination in Chinatown or wherever, you don’t know these neighborhoods even exist.